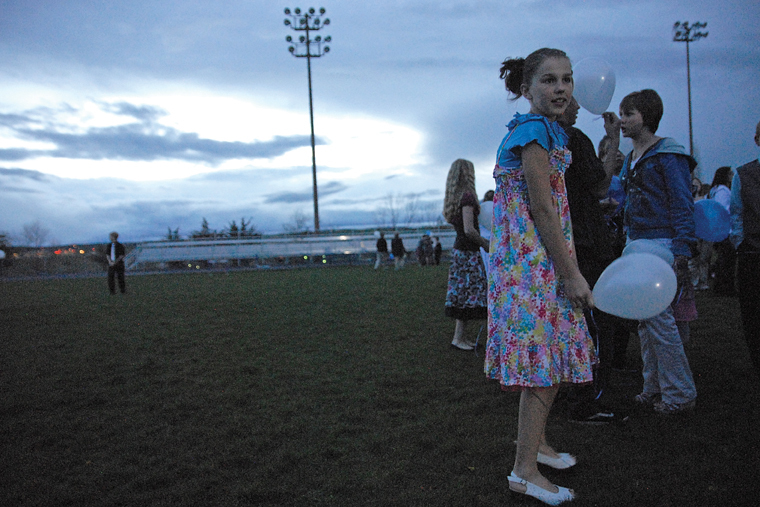 Craig Middle School seventh-grader Makenna Reidhead stands on the Moffat County High School football field Thursday during a balloon release in honor of CMS band teacher Craig Smith. Craig Middle School seventh-grader Emily Womble performs Thursday during a concert in honor of CMS band teacher Craig Smith. 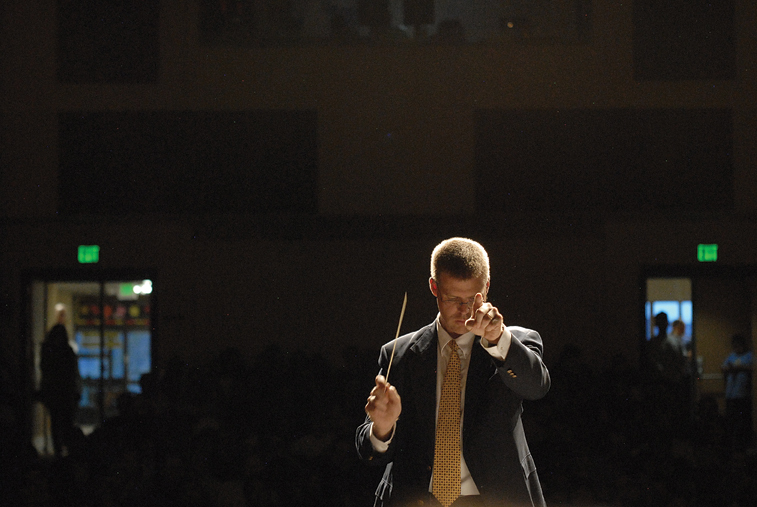 John Bolton, Moffat County High School band director, directs the Craig Middle School band Thursday at the MCHS auditorium. 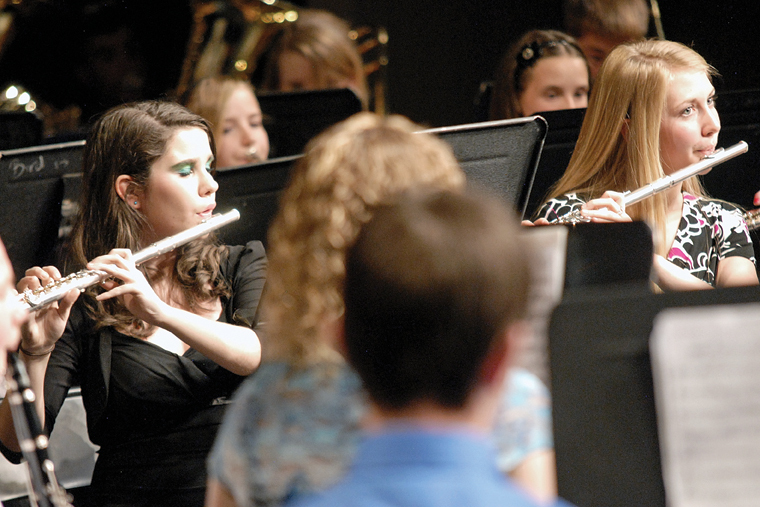 Bolton led the CMS band concert in place of CMS band teacher Craig Smith, who died Sunday. 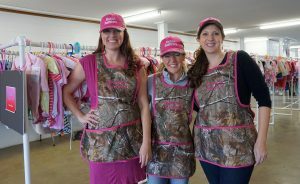 The performance was a tribute to Smith, a popular teacher at the middle school. Craig Middle School seventh-grader Allie Dilldine, center, performs Thursday during a concert in honor of CMS band teacher Craig Smith. 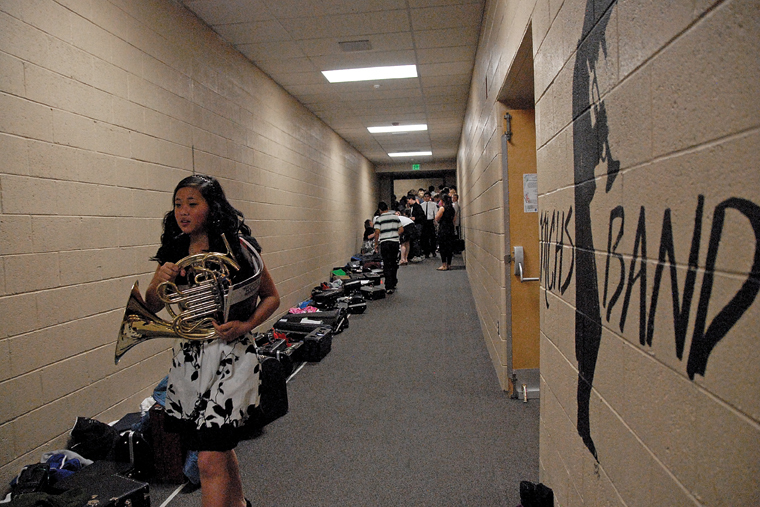 Craig Middle School eighth-grader Trenna Kaiser comforts fellow band members Thursday during a service honoring band teacher Craig Smith, who died Sunday. He was 64. 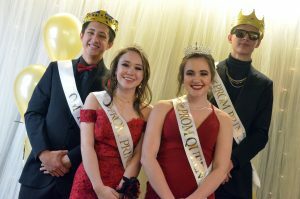 The service took place on the Moffat County High School football field after a CMS band and choir concert at the school’s auditorium. 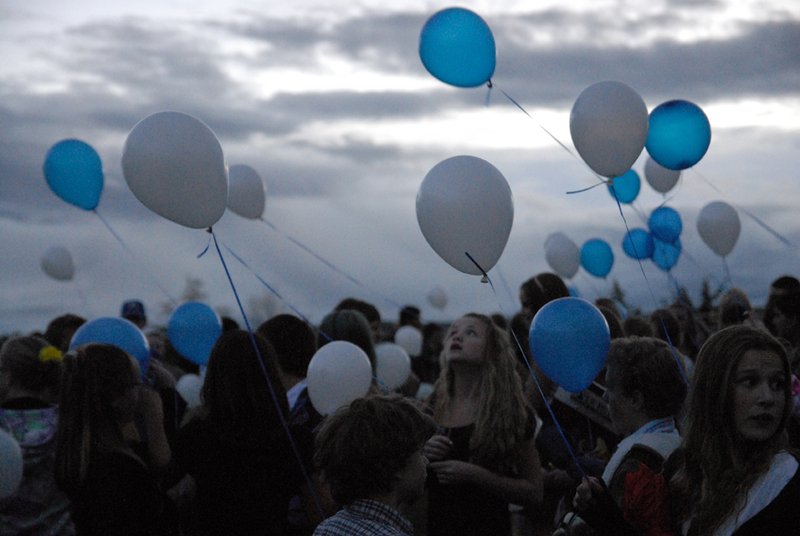 Hundreds of blue and white balloons were released from the field at sunset. 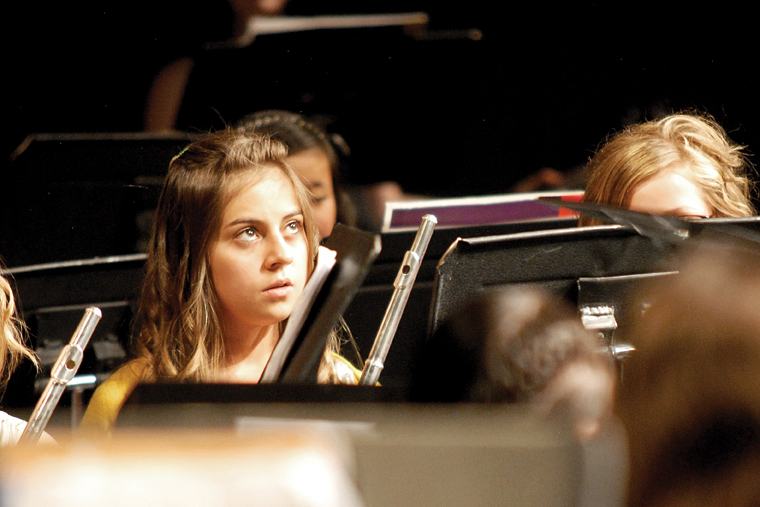 Craig Middle School seventh-grader Stephanie Duarte looks toward conductor John Bolton on the stage of the Moffat County High School auditorium. 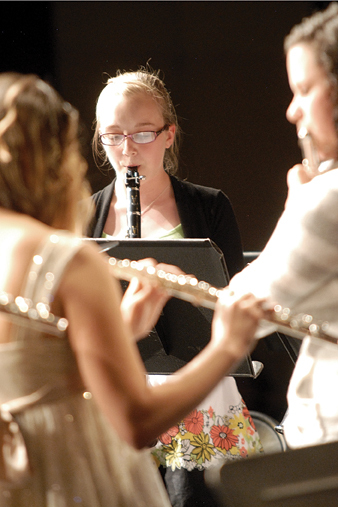 The event was originally put together by CMS band teacher Craig Smith as a spring concert. However, when Smith died on Sunday, Bolton took the baton and conducted the concert as a memorial. 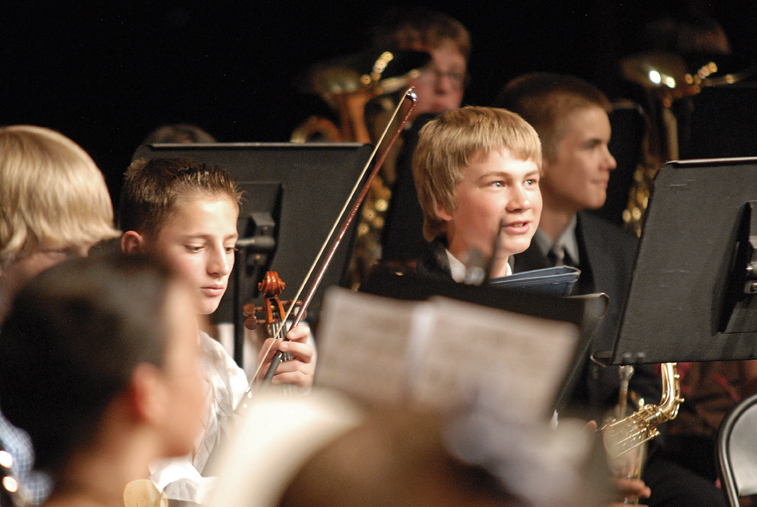 Craig Middle School seventh-grader Seth Jensen performs Thursday during a concert at Moffat County High School in honor of CMS band teacher Craig Smith. Craig Middle School seventh-graders Jacob Vallem, left, with the violin, and Aaron Lee performed Thursday during a concert at Moffat County High School in honor of CMS band teacher Craig Smith. Craig Middle School seventh-graders Katie Kennedy, left, and Samantha Ahlmer play the flute at Thursday’s concert in honor of Craig Smith. 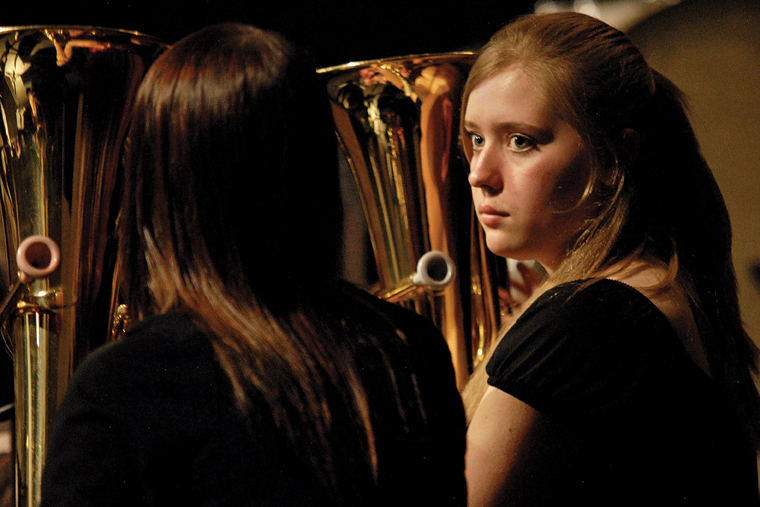 Craig Middle School eighth-grader Treann Quick, right, shares a moment with fellow baritone player Brynnae Dempster on Thursday on stage at the Moffat County High School auditorium. 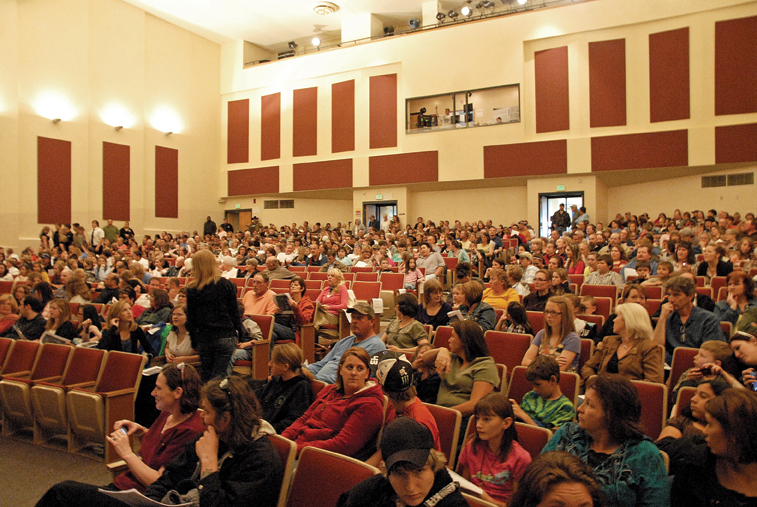 The crowd waits for the performance to begin Thursday at the Moffat County High School auditorium. 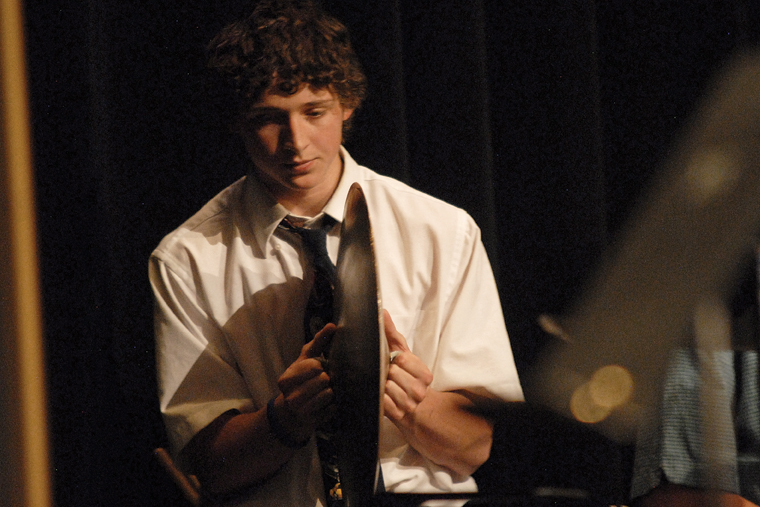 The Craig Middle School band performed a concert in honor of CMS teacher Craig Smith, who died Sunday. John Bolton, Moffat County High School band director, conducts the Craig Middle School sixth-grade band Thursday during the spring concert at the MCHS auditorium. Bolton filled in for CMS band teacher Craig Smith who died Sunday. 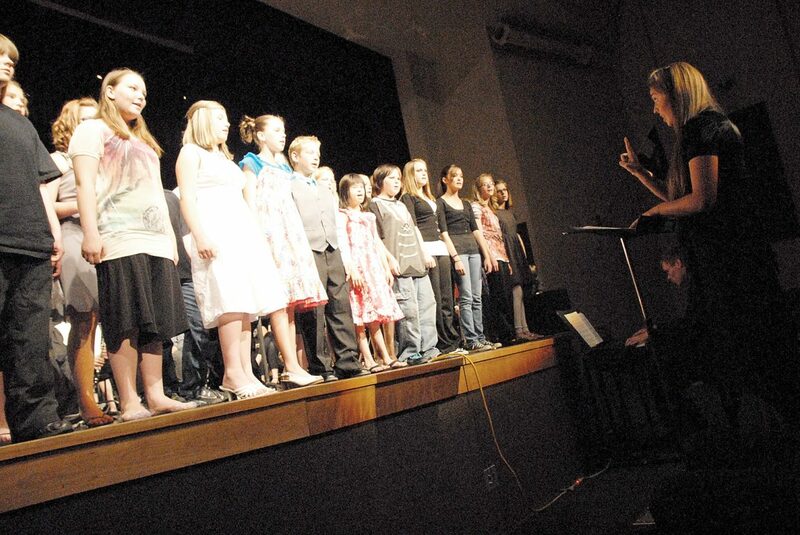 Moffat County High School senior Karen Bolton directs the Craig Middle School sixth-grade choir Thursday. 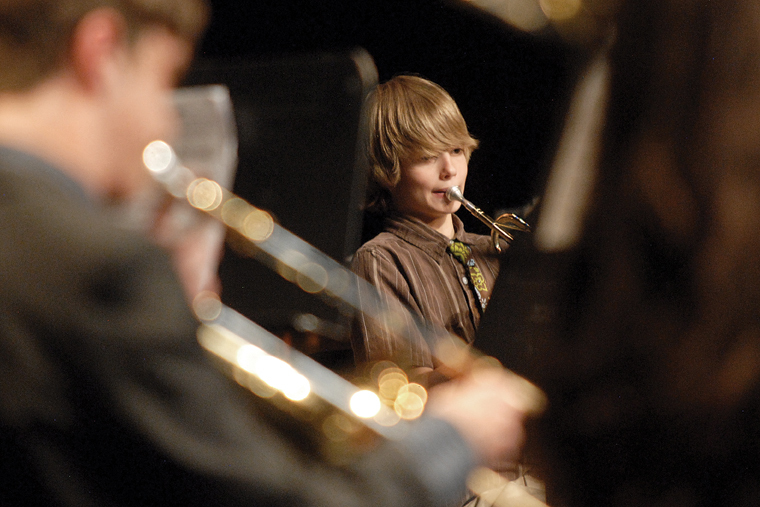 Craig Middle School seventh-grader Wyeth Krumrey plays trumpet Thursday on the stage of the Moffat County High School auditorium. 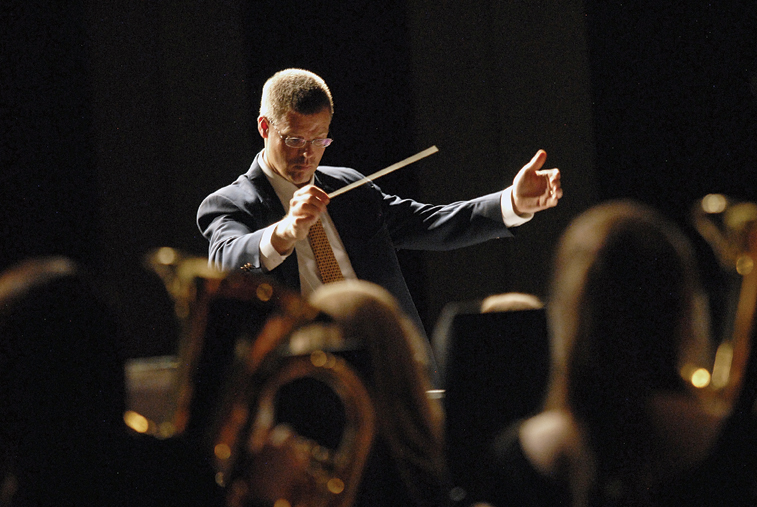 The concert memorialized CMS band teacher Craig Smith who died Sunday. 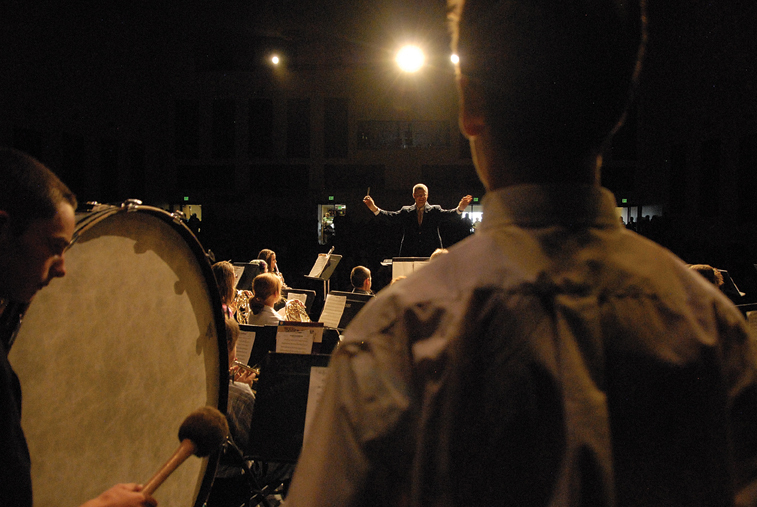 Moffat County High School band director John Bolton conducts Craig Middle School band members Thursday during the spring concert at the MCHS auditorium. Bolton filled in for CMS band teacher Craig Smith who died Sunday. 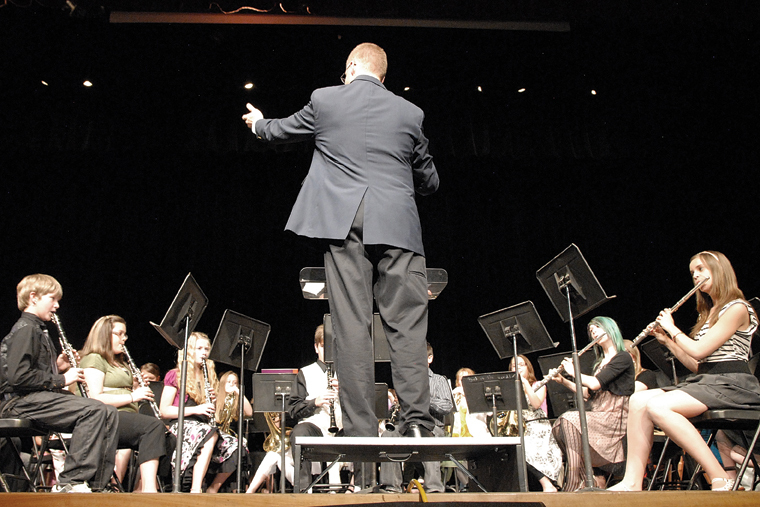 John Bolton, Moffat County High School band director, conducts the Craig Middle School eighth-grade band Thursday during the spring concert at the MCHS auditorium. 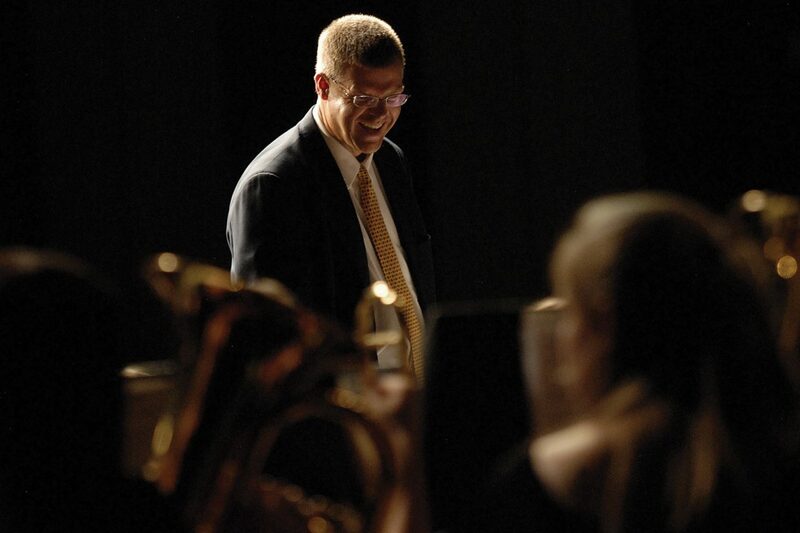 Bolton was filling in for CMS band teacher Craig Smith, who died Sunday. He was 64. The spring concert was a memorial to Smith. 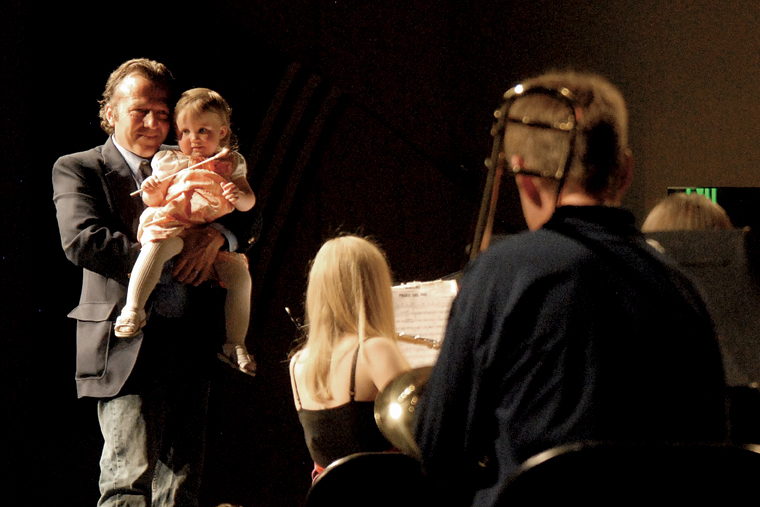 Deron Smith holds his daughter, Isabella Marie Smith, onstage Thursday at the Moffat County High School auditorium. Deron is the son of the late Craig Middle School band teacher Craig Smith, and Isabella is Craig’s granddaughter. 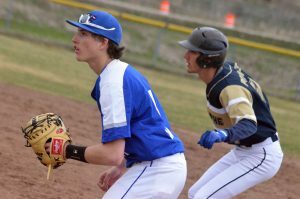 Craig Smith, a popular instructor at the middle school, died Sunday. Isabella “conducted” the final song of Thursday’s concert, which was a tribute to her grandfather. 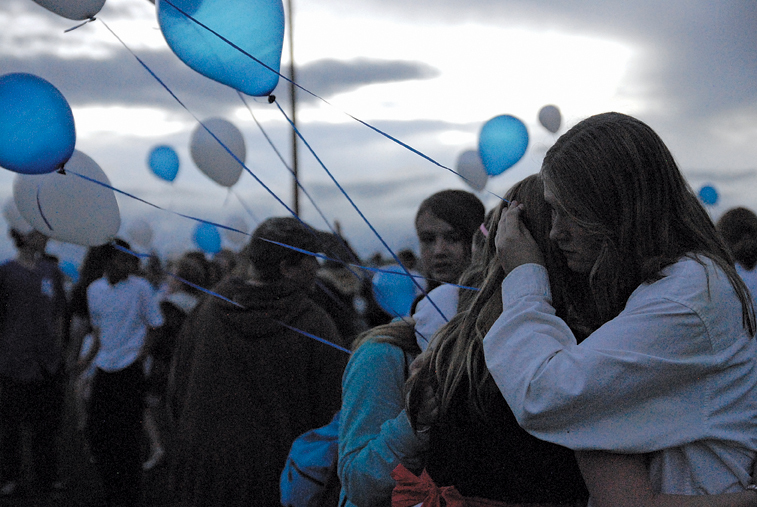 Blue and white balloons play in the breeze Thursday on the Moffat County High School football field. 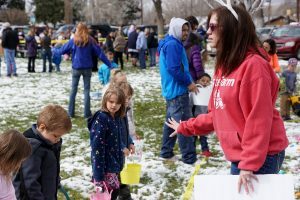 Hundreds of students, teachers and community members turned out for a farewell concert and balloon release for Craig Middle School band teacher Craig Smith who died Sunday. He was 64. 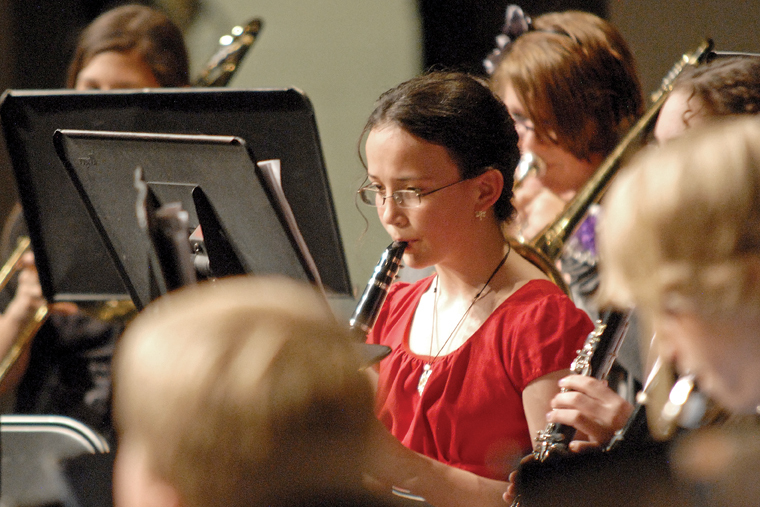 Craig Middle School seventh-grader Sarah Pressley prepares for a concert Thursday at Moffat County High School in honor of the late CMS band teacher Craig Smith. Moffat County High School band director John Bolton shares a light moment with the Craig Middle School eighth-grade band Thursday during the spring concert at the MCHS auditorium.